Explore the stunning beauty of Niagara Falls on this getaway that hits all the highlights of the area. Discover the wonders of Niagara Falls on this 4-day rail adventure. Beginning and ending in New York City, travel aboard Amtrak’s Maple Leaf for a full-day journey through upstate New York and into Ontario. Make the most of your two full days in Niagara Falls, enjoying the sights and sounds of the thundering falls and exploring the area’s local attractions. Board Amtrak’s Maple Leaf at New York's Penn Station this morning and settle in for your trip north. Enjoy the amenities of Coach Class, or choose to upgrade to Business Class at an additional cost. Travel through the lovely scenery of upstate New York as you make your way to Niagara Falls. Overnight Niagara Falls. Take advantage of all your Niagara Falls Adventure Pass has to offer as you tour the area at your pace. 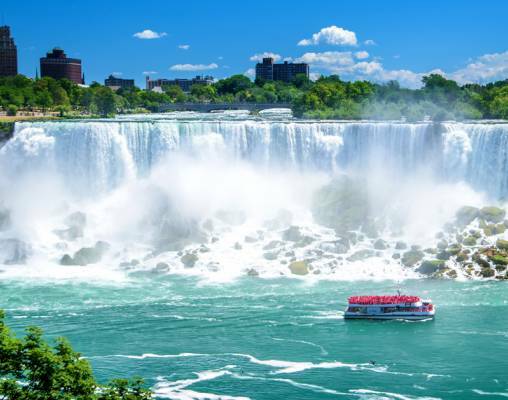 Your pass includes admission to the Hornblower Niagara Cruises for a spectacular ride that brings you as close to the rushing waters as possible. Then enjoy the Journey Behind the Falls tour, which takes you 150 feet below ground to tunnels that lead to observation spots right at the foot of the Falls. 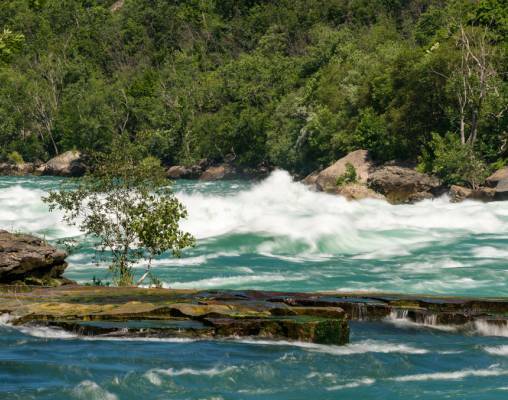 You can also take in the interactive show of Niagara's Fury or stroll the White Water Walk on a boardwalk nestled beside the Class 6 Whirlpool Rapids. You also have 2 days of WEGO bus access, the Hop-on, Hop-off bus transportation system that connects Niagara Parks with other tourist areas in the city. You might want to wrap up one of your days of adventure with an optional Niagara Falls Illumination Dinner Package (additional cost). Overnight Niagara Falls. This morning, board the Maple Leaf for your return trip to New York. Your vacation concludes upon arrival at New York’s Penn Station. Hotels include Marriott on the Falls (Moderate), Hilton Hotel & Suites Niagara Falls Fallsview (Superior), and Marriott Fallsview Hotel & Spa (Deluxe). Amtrak accommodations are available in Coach Class or Business Class. Coach Class accommodations feature a reclining seat with leg rest. Business Class accommodations include a reclining seat with extra legroom and complimentary non-alcoholic drinks. Click here to view testimonials for New York to Niagara Falls. Everything was beyond our expectations. My overall experience was very great. The services received from VBR were excellent. Thank you for acquiring the upgraded room at the hotel- made the moment! Enter your details below if you would like to be notified when 2020 dates and prices are available for New York to Niagara Falls. Prices are correct at the time of publication, however are subject to change at time of booking. Hotel and Rail accommodations listed above, are subject to change based on availability at the time of booking. Prices are land-only, per person based on double occupancy.